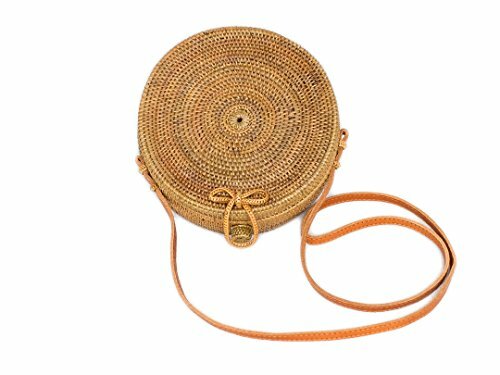 This unique round woven shoulder bag is individually handcrafted using Ata reed, the traditional and unique art heritage from the east of Bali. The bag is the perfect size for your mobile phone, wallet, lip balm and even your sunnies. They come with traditional Hand Woven Pattern and a Strap. Each bag is handmade and therefore unique on its own, and may vary slightly in size and detail due to the nature of this item. Once woven, the bags are smoked in a traditional oven over coconut husks as part of the drying process to add strength and durability. The smoky scent is due to this making process, but will naturally disappear over time. CARE INSTRUCTIONS: Use cloth or brush to remove possible dust from the woven straw. Wipe the bag with a clean damp cloth and wipe dry; never over wet the straw. Allow to air dry away from direct sunlight. If you have any questions about this product by Bali Harvest, contact us by completing and submitting the form below. If you are looking for a specif part number, please include it with your message.